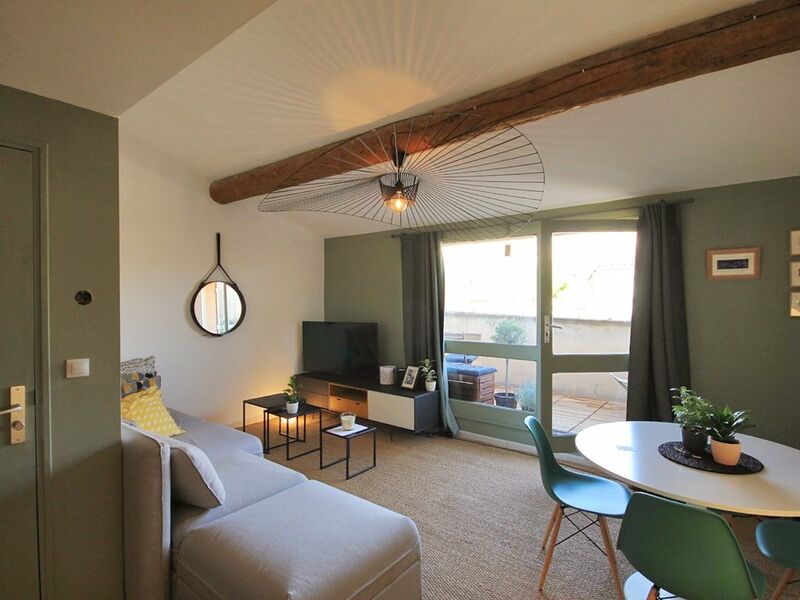 In the heart of the historical center of Avignon, apartment ideally located (Rue Grande Fusterie) near the Palais des Papes and near the Pont d'Avignon, museums, theaters, shopping, food, pharmacy and all amenities. Completely renovated in 2017, it has all the necessary to comfortably accommodate 4 people. Apartment ***** in the center of Avignon on the 4th floor (without elevator). Spacious living room with a very comfortable sofa bed (2 people), television with (Netflix) and a dining table for 4 people. The room has a double bed 160cm and several tidying up. Independent shower room with Italian shower, towel dryer and a washing machine. Separate WC. The apartment has air conditioning (living room and bedroom) and internet Wifi. Place your suitcase and make yourself at home. This apartment is really cute. It is equipped with everything needed for a comfortable stay. Air conditioning was super during the heat wave, a washing machine to catch up on laundry a small but fully equipped kitchen to fix your own meals whenever you like. The balcony is a super spot in the morning and evening. The apartment is in walking distance to all the sites of Avignon. It is a very quiet spot, no noise to disturb a good night's sleep! I hope to stay here again on my next trip to Avignon.